I have often heard the adage, “In education, what’s old is new again.” While this is true of some initiatives, I’ve been in education long enough to know these strategies are improved upon as they come around each time. I also know that there are definite emerging trends that are completely new to the world of education for the current generation of students. I’m going to discuss four of the hottest right now, though they definitely have areas of overlap. Blended learning strategies allow for maximizing personalized learning opportunities. Pflugerville ISD, Texas, had several students at one high school that wanted to take Arabic, but their school didn’t offer that as a foreign language choice. Another school in the district, however, has it as a course offering. So, they put these eight students into a classroom with a German teacher during his planning period, and the students video conference into the Arabic class at the other school each day. Another example includes an alternative school in Crowley ISD. A middle school math teacher utilizes OneNote and Khan Academy to allow his ever-changing student enrollment to work independently since they come to him at all different places in the curriculum. This frees him up to work individually with each student as the need arises. These are only two examples of how blended learning strategies open possibilities for all students’ learning. Formative assessments taken digitally can provide immediate feedback to both the student and the teacher allowing them to be constantly adjusting instruction to best meet individual needs. 250 Virtual Field Trips…. most of them are free! The benefits of tapping into these resources are exponential! Authentic Learning Experiences: Now many of you might say this isn’t an “emerging trend” but has been an area of best practice for years. I won’t argue with that. The widespread implementation of Project Based Learning and Genius Hour, however, is still catching on in many areas. Anytime we can tap into a student’s personal interests, we up the authenticity of instruction. In addition to Genius Hour, Writer’s and Reader’s Workshop also allows for student choice, as well, as personalized instruction during conferences to drive student learning when and where they need it most. We hear a lot about real-world problems. Here are two snapshots (one from high school, and one from kindergarten) that are fantastic examples of addressing real issues. Ms. Cox, Spartanburg 5 in South Carolina, is a kindergarten teacher. She noticed during a zoo field trip last year that the students just kind of ran around all day. While she knows the zoo is a valuable experience for the kindergartners, she just didn’t see much learning being done. She decided to do something different for this school year’s trip. This year, prior to the trip, the students will select an animal to study. They will learn about it’s living needs (food, adequate enclosure space, etc). Partnering with an engineering class at the high school, the kindergartners will then work on designing a model of a proper zoo enclosure for their animal, creating it on a 3-D printer. They will also use measurements and build a life-sized model of their animal, choosing from a variety of mediums. Ms. Cox is then working on having people from the zoo come in to hear the final presentations from the students to give them an authentic audience. Mr. Patterson is an engineering teacher at a CTE high school in Crowley, TX. He had a real problem that needed solved. His wife has a hard top Jeep and it usually takes four adults to remove the top. He tasked his students to work with partners to design a lift to remove the top. First, they drew designs in CAD.Then, they chose from five different types of materials to build a prototype of the design. After that, they presented their ideas to the class, and as a whole, they voted on the one to actually build. The teacher provided all of the materials for the actual lift since this was something his wife would be using. It was a huge success and took his students through every phase of the design process, while also giving them the satisfaction from building the lift. 4. Learning Space Design: This is in the early stages of really taking center stage. The easiest way to consider changing your learning space design is through flexible seating. I see this done all the time in elementary classes. Teachers will have spaces around the room where students can sit on pillows, or at tables, or at desks. They even have various items to sit on (exercise balls, crates, stools, chairs, even five-gallon buckets!). Elementary teachers have embraced the benefits of collaborative seating arrangements for years, as well. Sadly, these ideas are often missing in many secondary classrooms. Desks in rows with no other options for seating is still the norm for the majority of middle and high schools. I have had the pleasure of seeing some newly built and/or newly renovated high schools, however, that are working hard towards embracing the science behind learning space design. In these buildings, we see comfortable seating with charging stations, commons spaces throughout the school for students to work with each other, small conference rooms for group projects, and more modular seating options within the classrooms, as well. I recently read The Space: A Guide for Educators by Robert Dillon and Rebecca Louise Hare. It’s a fantastic read that is about so much more than just learning space design. I often recommend it to educators I’m working with because of the inherent pedagogy that weaves throughout the discussions on design. I’m won’t give away the details of the book, but one big takeaway I had was in the need for quiet space in today’s classrooms. By that, I don’t just mean audibly quiet, but space that is left uncluttered for the mind to quiet itself. These spaces are often missing in many elementary classrooms. There is a lot of validity to hanging anchor charts in the classroom, but I’m struck by how every blank wall space, cabinet space, bulletin board space, door space (you get the point) is covered in anchor charts, student work, motivational posters, or cute decorations. Trust me, I had one of those classrooms. I wanted to create “our” space with my students. While that is great, there still needs to be a corner somewhere that’s left free of clutter for students who would benefit from a designated location to settle their brains in order to forge new learning. 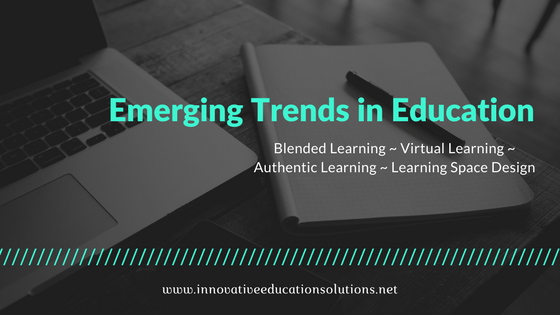 We can call these trends, but they really are just part of an ongoing conversation around best practices in teaching and learning. This is an exciting time to be part of the educational landscape, shaping the experiences are students get to have each day. Let’s make these experiences engaging and the effects long-lasting. This entry was posted in Education, Leadership, Professional Experiences, Technology and tagged education, educational consulting, educational technology, trends. Bookmark the permalink.